Oil Firms Seek To Prove They Can Contain Spills A year after the blowout at BP's Macondo oil well, the government is starting to issue drilling permits in the Gulf of Mexico again. But the bar for such permits has been raised substantially: Drillers must prove they can contain an out-of-control well if something goes wrong. In response, two huge efforts to create containment systems were launched. One year after a deadly blowout at BP's Macondo oil well, deep-water drilling companies in the Gulf of Mexico are just now getting back to work. They're doing so under a tough new regulator and with a lot more rules governing them. Now oil companies must prove they can contain an out-of-control well before they start drilling. After BP's massive oil spill, the Obama administration placed a moratorium on deep-water drilling in the Gulf. The agency charged with regulating offshore drilling was overhauled and given a new name: the Bureau of Ocean Energy Management, Regulation and Enforcement (BOEMRE). Former federal prosecutor and inspector general Michael Bromwich was put in charge. In February, he says, the industry finally proved to him that it had equipment and plans in place to contain well blowouts. "Then and only then did we feel comfortable approving permits for deep-water drilling," Bromwich says. NPR was among a few media outlets recently allowed to examine, up close, the equipment companies are using to prove they can do that. 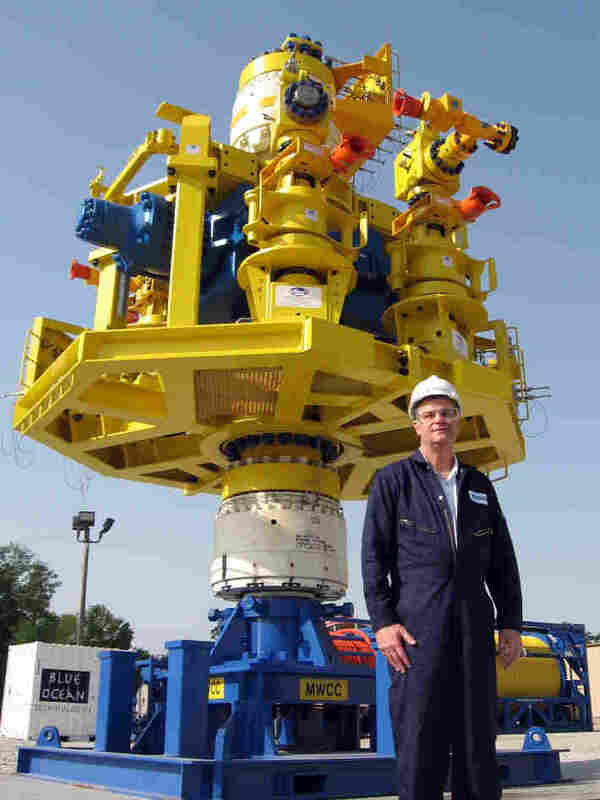 Dan Smallwood, chief operating officer for Marine Well Containment Co., stands in front of a capping stack that would be placed over an oil well to cap it off in an emergency. Sitting in a gravel lot north of downtown Houston is a shiny new, yellow-and-blue capping stack that belongs to the Marine Well Containment Co. (MWCC). "It's about 30 feet tall," says MWCC CEO Marty Massey, "It's 14 feet wide. It weighs 100 tons." The capping stack needs that kind of bulk to withstand the extraordinary pressures in the deep waters of the Gulf of Mexico. In an emergency, it would be placed over a well to cap it off, and then it could divert oil to ships up on the surface. It's similar to what was used to eventually bring the Macondo well under control. This particular capping stack is part of an interim system that oil companies put in place; a permanent one will be finished next year. "The expanded system will be able to handle 100,000 barrels of fluid a day, and it can operate in 10,000 feet of water," Massey says. MWCC is a not-for-profit company formed after some of the largest oil companies joined forces to share the $1 billion cost of building a containment system. Among the members is Shell, which holds the distinction of getting the first new deep-water permit issued since the oil spill. Shell used its membership in the MWCC to meet regulators' containment requirement. Mark Shuster, exploration manager for Shell in the Gulf of Mexico, says the relationship with regulators has evolved and is becoming more productive. "Early after the event and during the moratorium, there wasn't much open communication," he says. But now, he says, the relationship has evolved and matured, and there's more dialogue back and forth. Shuster says now it's clearer what oil companies need to do if they want to drill in the Gulf of Mexico. "What isn't clear to us right now is how long the review and approval process will actually take," he says. BOEMRE is quickly trying to hire more staff to fulfill its expanded role. Bromwich recently toured college campuses around the country, encouraging students studying engineering and environmental sciences to consider a career with his agency. 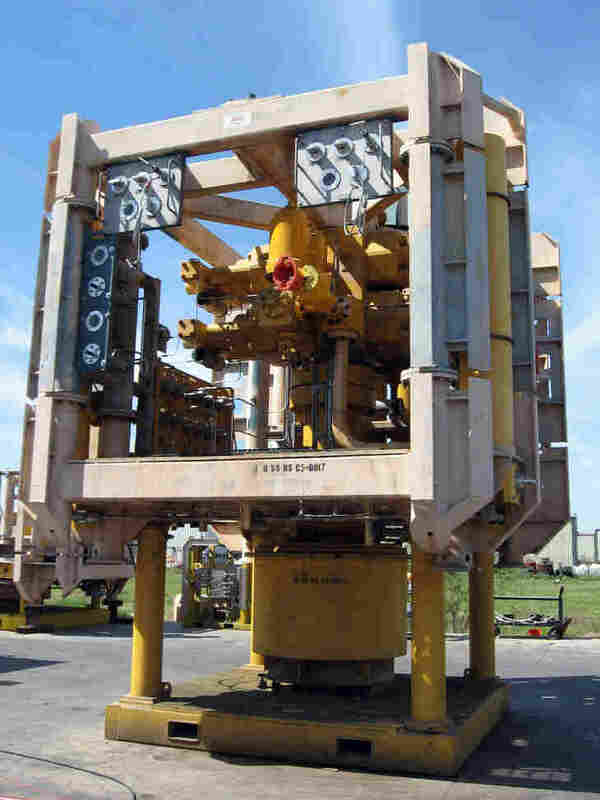 The Helix Well Containment Group's capping stack is stored in an equipment yard in Houston and can be transported by truck to a dock within hours. There are actually two federally approved containment systems operating now. The other is the Helix Well Containment Group (HWCG), and it offers a more economical alternative for its 24 member companies that drill in the Gulf. HWCG's equipment is stored in an industrial area west of downtown Houston. "One thing that we have done, which is a step change for the whole industry, is we've signed a mutual-aid agreement," says Roger Scheuermann, commercial director for the Helix group. That means all of the member companies will come to each other's aid if there's an emergency. They'll share equipment and personnel, making it more affordable for smaller companies to comply with the federal requirements. Scheuermann says there's a detailed plan in place, and if something happens, members know exactly what they're supposed to do. He says within just a few hours, Helix's capping stack would be on its way to a dock. "We'll be able to load it up [on a truck], get a permit and move it to the location that's necessary," he says. "If we were going to Galveston, I would say we'd probably be there in six to eight hours." It would still take more time to get the equipment out to the location in the Gulf. But the response for both systems likely will take days instead of the weeks required to bring BP's Macondo well under control. "I think it's great if they work," says David Pettit, senior attorney with Natural Resources Defense Council. Pettit says while regulators are doing a much better job now, he still is not confident that the containment systems are ready to handle anything that could go wrong. "What would inspire confidence for me would be some kind of test in, if not real-world conditions, a test under conditions of extremely high pressure," he says. Helix plans to conduct underwater tests sometime in the future. And both of the containment organizations say their systems use components that are well-tested and known within the industry. They say the designs were effectively tested when the Macondo blowout was controlled. So far, BP is not among those drilling new wells yet. But the company has joined the Marine Well Containment Co., and it remains the largest lease-holder in the Gulf. So it could be just a matter of time before BP resumes drilling, too. A previous version of the caption for the first photo incorrectly identified the subject as Marty Massey, CEO of the Marine Well Containment Co. The photo actually shows Chief Operating Officer Dan Smallwood.